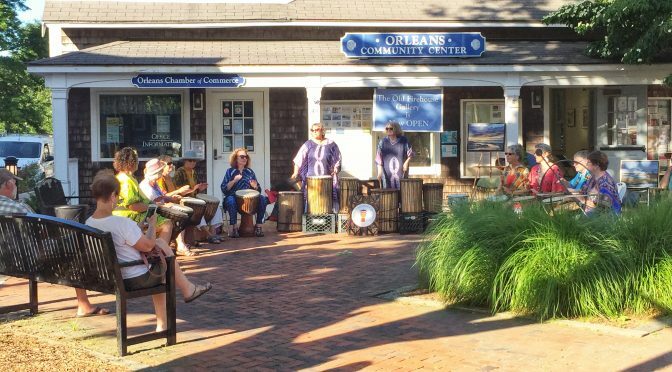 Live In Orleans On Cape Cod Is Not To Be Missed! Live In Orleans, a weekly music festival, has been so much fun this summer. Live in Orleans features four bands every Tuesday from 5-7pm, July 10- August 14. The festival will showcase a total 24 bands ranging in musical styles from folk and blues to country, rock, and sounds from around the world. One of the bands that we saw last Tuesday was called the The Drummer Queens and they were awesome! Ten women made up the band of only drummers and the music and enthusiasm was contagious! We have listened to so many different kinds of music and each has been delightful. What a great way to spend a Tuesday evening. If you’re in town, you still have a few more weeks to enjoy the music at Live in Orleans! Live music beats recorded music any day! What fun!